We cannot supply you any of our goods as we don’t want or need your blood money! We don’t want to aid and abet organizations that are responsible for crimes against humanity. Please don’t pay! Don’t contaminate our account with your blood money! On 18th October 2010, the SA Zionist Federation, which openly supports settlements built on stolen Palestinian land, placed a $1,200 order for 249 bags in preparation for its 47th Annual Conference. 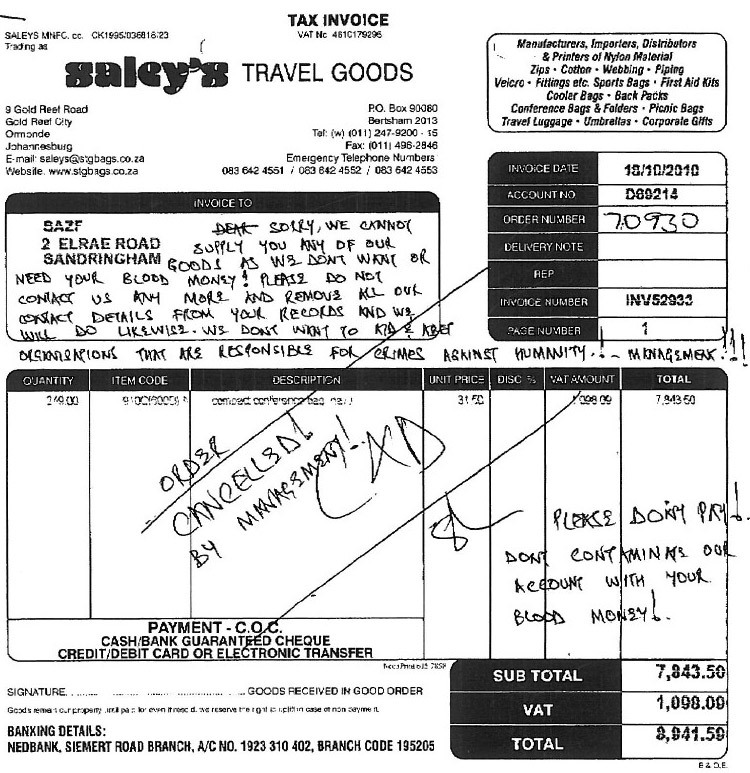 The following day it received the rejected invoice from Saley’s Travel Goods stating "Order cancelled by management!". Saleys Travel Goods, fittingly located across the road from the Apartheid Museum in Gold Reef City in Ormonde, had taken a principled stand against Israeli apartheid. The Zionist Federation invoice was returned with the words "Sorry, we cannot supply you any of our goods as we don’t want or need your blood money! Please do not contact us any more and remove all our contact details from your records and we will do likewise. We don’t want to aid and abet organizations that are responsible for crimes against humanity. Please don’t pay! Don’t contaminate our account with your blood money!". With those powerful words Saleys Travel Goods joined the global BDS (Boycott Divestment Sanctions) movement against apartheid Israel and set the standard for other businesses in South Africa and around the world to follow. The Zionist Federation's reaction was predicable: "We have never before been confronted with such naked hostility, such unbridled hatred, such disgusting slander and such overt anti-Semitic sentiment" they cried on their website hoping their zionist minions will take revenge on Saley’s Travel Goods. For our part we must support the principled stand Saley’s Travel Goods has taken and thereby encourage other to take similar stands. 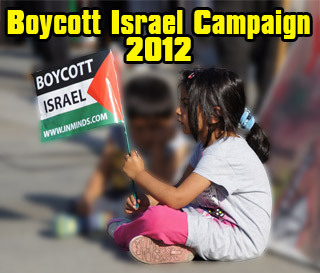 The latest scandal to hit a self-confessed pro-Israeli organization in South Africa, the SA Zionist Federation, [SAZF] is likely to invigorate the “Boycott, Divestment & Sanctions” [BDS] campaign against Israel and its affiliates. This remarkable turn of events involves a Johannesburg-based bag company manufacturing company, Saley’s Travel Goods, who refused to supply the SAZF with goods on the grounds that it did not want to “aid and abet” organizations responsible for “crimes against humanity”. The SAZF, known for its links to apartheid Israel, has in the recent past been embroiled in a number of headline grabbing controversies surrounding its defense of Israeli war crimes. Most notable has been its failed attempt to prevent a leading South African jurist, Judge Richard Goldstone from attending his grandson’s barmitzvah. This move was interpreted by many Jewish critics of Israel as a form of punishing Goldstone for his report on Operation Cast Lead that established Israel’s guilt in Gaza. More recently a Cape Town NGO known as Open Shuhada Street, whose members comprise of prominent human rights activists accused the SAZF of supporting occupation, settlement and oppression. According to Open Shuhada Street, in response to it’s call to boycott the settlement-made products of Ahava, the SAZF launched a “vicious personal attack on us”. Ahava is manufactured in an Israeli settlement in the Occupied West Bank and thus a call for a boycott of its products is necessary to make the occupation unprofitable. Instead of recognising this undisputed fact, the SAZF has called for people to increase their purchases of Ahava. Open Shuhada Street has therefore accused the SAZF of being devoted to increasing the profitability of the occupation and of defending the use of Occupied Territory “in violation of international law and to entrenching and sustaining Israeli settlements which stand in the way of peace”. This exposes the SAZF as an obstacle to peace! In 2005 our research unit within the Media Review Network [MRN] had verified that the SAZF has been actively promoting the emigration of South African Jews to a settlement called Modi’in in the West Bank. Despite Modi’in being built on stolen Palestinian land, it is promoted as an Israeli city! Telfed [the SAZF branch based in Raanana, Israel] together with the SAZF have been spearheading the marketing of Modi’in and not surprising too that developers have tried to create a community of SA Jews by offering apartments and homes at discounted prices. Claiming to be offended now that Saley’s has courageously chosen its constitutional right to not be indirectly encouraging Palestinian oppression that the SAZF has on various occasions publically endorsed through statements of support for Israeli military operations in the Gaza, will not wash! Neither will it be morally acceptable to adopt any form of vindictive measures against businesses such as Saley’s – whose decision not to do business with the SAZF has set a new standard for BDS in South Africa! Its been pointed out that there is more than one place starting with the name "Modi’in" and that the one referred to in the article is the one that is inside the green line so built on Palestinian land stolen in 1948 as opposed to a settlement built on land stolen in 1967. This does not change the fact that the SA Zionist Federation through Telfed supports settlements as they also promote Aliyah to settlements such as Ma'aleh Adumim in the West Bank which it refers to as being "in Israel" (see http://www.telfed.org.il/content/english-speaking-aliyah-garin-maaleh-adumim ) [inminds].